Nina Ricci’s Peter Copping described his spring palette as “alabaster, chalk, plaster, Chantilly and porcelain,” which is to say that he used a lot of white. This variety also reflects how nuanced the white looks were in other collections, including Preen, Ports 1961, Chanel and Jason Wu. On the maximal side of the neutral spectrum, Thom Browne’s elaborate period pieces came across as twisted and fantastical – you might call them power whites. From faces at Prada to footwear at Mary Katrantzou, the strongest prints this season were magnified to fill considerable space on coats and dresses. The Roman coins at Dolce & Gabbana were the size of pancakes. And Mulberry’s florals were stretched and pulled beyond garden-variety proportions. But it was Miuccia’s oversized visages, created by a roster of international street artists, that made it into the closets of fashion’s pre-eminent Annas (Wintour and Dello Russo, of course). 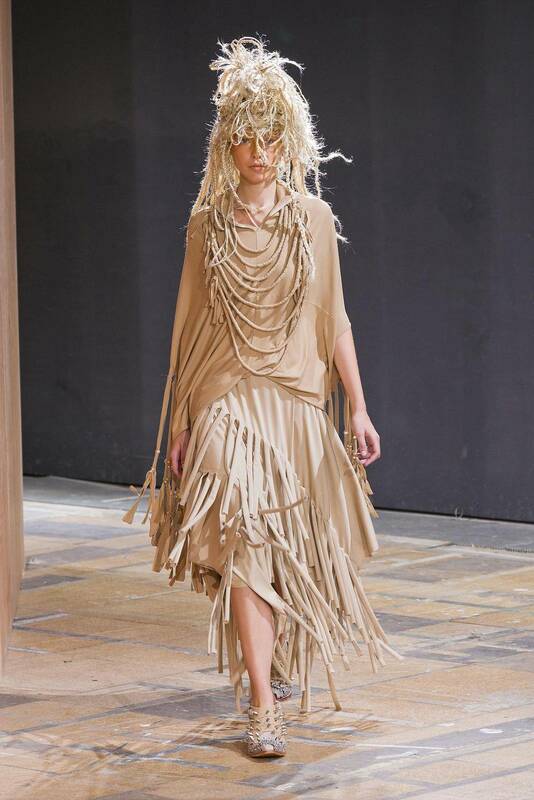 Overlook the cowboy connotation and fringe becomes a compelling way for a designer to explore movement and texture. 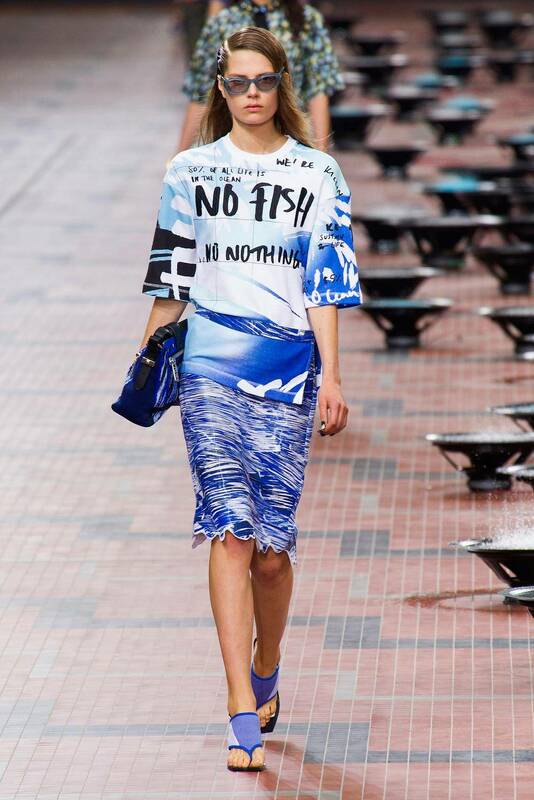 Junya Watanabe tackled it with impressive craftsmanship, showing versions that were hefty like dreadlocks. Rodarte’s Kate and Laura Mulleavy edged the diagonal hemlines of miniskirts and bra tops with long threads, adding more coverage and rock-chick allure. At Céline, fringe trailed behind a long coat and from the base of handbags. The cutouts that caused such a stir in seasons past have given way to inserts made of technical mesh. Sacai’s ruffled collars and athletic netting confirmed designer Chitose Abe’s yin-yang talent for rethinking what it means to dress up and down. Anthony Vaccarello, the master of chic immodesty, used a cobwebbed mesh to define the body rather than expose it in full. Sexiness was similarly over-the-top at Gucci, where Frida Giannini showed finely perforated blouses. For his final turn at Louis Vuitton, Marc Jacobs dedicated his collection to “the showgirl in all of us.” The theatricality of his jet-beaded bodysuits, ornamented sheer overlays and soaring feather headdresses made for quite the swan song. The complementary themes of sparkle and spectacle also made an appearance at Maison Martin Margiela and Tom Ford, whose mirror-mosaic mini-dresses hit the sweet spot between glam and gauche. If the term palazzo pants conjures up visions of eighties socialites with bad perms, rest assured that, in the right hands, flowing trousers have wide appeal. Elie Saab and BCBG Max Azria were among the labels that revisited languid bottoms, avoiding the look of a Dynasty costume by keeping the volume tailored instead of trapezoidal. With its modified paper-bag waist and exaggerated cuffs, Marni’s version is a palazzo-sailor-pant cross. The most noteworthy aspect of the glut of gilding this season is its fluidity. 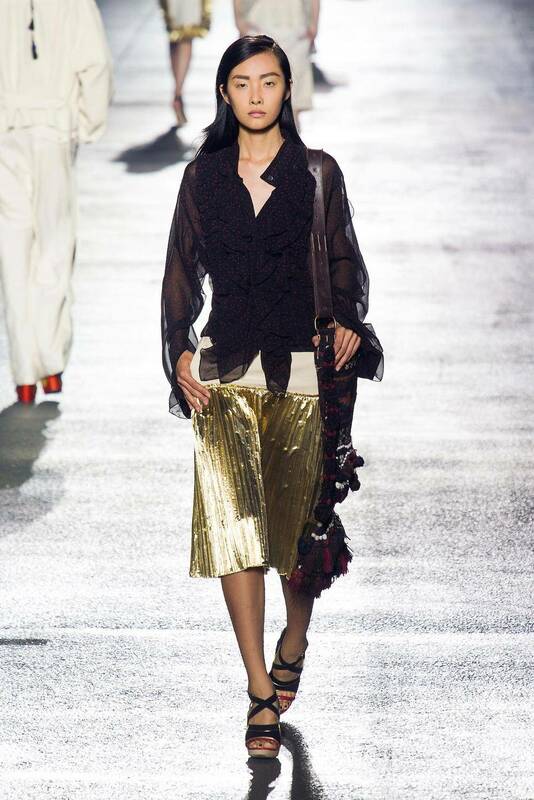 Gold appeared liquid-like on slinky dresses at Saint Laurent, Proenza Schouler and Diane von Furstenberg. Dries Van Noten’s pleated skirts and ruffled blouses looked as if they had been hammered from a paper-thin sheet of metal. Christopher Kane sent out an asymmetrical gold dress that rippled across the décolletage. Altuzarra, meanwhile, used draping to achieve a unique lustrous slouch.